Overcooked mayhem for the pre-summer movie season. Olympus Has Fallen cruxes on a ruthless demolition raid on the White House by North Korean insurgents. Gerard Butler stars as a disgraced (and stolid) Secret Service agent seeking redemption on duty. An eclectic mixed cast includes Angela Bassett as the head of the Secret Service, Morgan Freeman as the Speaker of the House, and Melissa Leo as the Secretary of Defense. Aaron Eckhart in particular seems out of element as the United States President, coming off little more than a Little League baseball coach. The major holdback of “Olympus” is that it is more bluntly, viciously violent than most of its “Die Hard” genre predecessors. 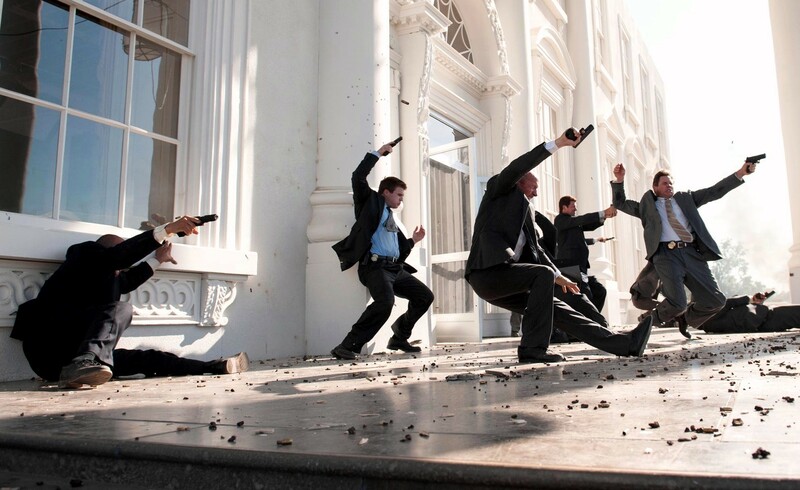 The raid – the showpiece of “Olympus” – is astonishingly well-choreographed as D.C. gets annihilated in the early scenes. It’s gasping to see the White House, the most protected building in America, getting torn apart by rogue fighter jets, suicide bombers and other advanced artillery. If Michael Bay had directed “Dr. Strangelove” with vertiginous aggression it might have looked like this, and the message might be: This is how unprepared America would be if an organized platoon attacked us. But after that, the action mostly happens in corridors, various offices, and a secret crawlspace. Then there are cutaways to the hostages down below. President Asher spends his every breath begging his North Korean captors to not execute his cabinet staff while they huddle 16-floors down in the House bunker. The terrorists need the codes from the President for the nuclear arms fail-safe which could blow up major American cities if activated (America would become an infertile, barren wasteland). I kept wondering how Butler, as Agent Banning, was going to sneak down to the bunker undetected through many some secret staircase. The movie is lacking in wit, really, in that aspect since the bunker rescue is really just prolonged until… the end. There’s no thinking or strategy to Banning, he just goes through one henchman dispatch at a time. Antoine Fuqua (“Training Day”) is the no-holds-barred, jackhammer director. I wish he had better lighting creativity for the interior combat scenes. It’s a rather diffuse visual picture when the fighting gets past midnight. I also wish the music wasn’t so one-note, it would have been better if it took inspiration from the turbulent and maniacal scores of “Under Siege” by Gary Chang or “Speed” by Mark Mancina. The music for “Olympus” is functional, tangential and without personality. And some of the movie is like that, too. You want more out of the characters. The few sterling lines of patriotism delivered by Freeman boosts some fervor, and there is some demonstrative American pride that’s served by Leo (until beatings are unleashed on her), and the cockamamie Robert Forster who is itching to go with an all-in blitz. The script, lacking juicy one-liners, does come up with topical South vs. North Korean history and the tension surrounding their demilitarized zones. That’s relevant, but what “Olympus” is missing is a droll smart aleck hero like John McClane or Casey Ryback at the core. Butler is a sturdy brute force hero, but he lacks humor. Nobody is going to remember much of Butler’s Mike Banning. 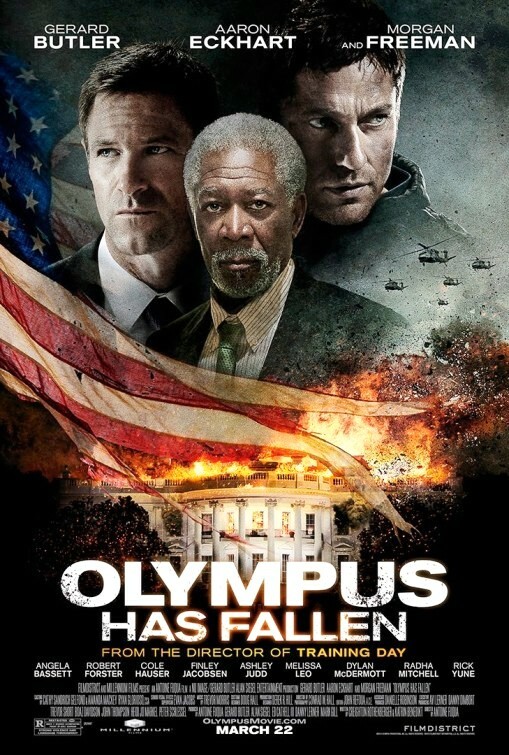 “Olympus” is mindless action pandemonium, which is OK for the commercial audiences but not for the discriminating mind. Film Cousins: “Die Hard 2: Die Harder” (1990); “Under Siege” (1992); “Air Force One” (1997); “Red Dawn” (2012).